There has been a lot of talk lately about 'QE' and 'QE2' regarding the efforts of the Federal Reserve to somehow ease the money supply even more than they already have done and help re-inflate the economy from its past depressed levels. "Good evening. On Tuesday, we Americans will have the opportunity to exercise our role as citizens in a free democracy. Yet, only a third of the eligible voters will actually cast ballots. The other two-thirds are, in a sense, very lucky. Because they do not know what's going on. For example, consider this: in the year 2000, if current trends continue, the average blue-collar annual wage in this country will be $568,000. Think what this inflated world of the future will mean - most Americans will be millionaires. Everyone will feel like a bigshot. Wouldn't you like to own a $4,000 suit, and smoke a $75 cigar, drive a $600,000 car? But what about people on fixed incomes? They have always been the true victims of inflation. That's why I will present to Congress the 'Inflation Maintenance Program', whereby the U.S. Treasury will make up any inflation-caused losses to direct tax rebates to the public in cash. But so what? We'll just print more money! We have the papers, we have the mints. Sure, all these dollars will cause even more inflation, but who cares? Everyone will be a millionaire! In my speech last week, I said that America would have to undergo an austerity program, but since this revolutionary new approach welcomes inflation, our economy will be free to grow, and we can spend, spend, spend! I believe the watchwords for the 80's should be 'Let's Party!' "
And the 90's. And the New Millennium, at least up until or about June of 2008. 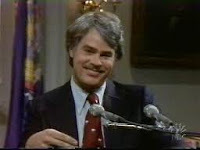 Actually, these words were written and spoken by the genius Dan Aykroyd as 'President Jimmy Carter' on 'Saturday Night Live' one week before the mid-term elections in 1978. Did Aykroyd actually ever get elected to anything? Could an actor ever get elected to any high office in this land and actually 'do something' while in office? He sure sounds exactly like he knew what he was talking about, even in a comedic mood. The fact of the matter, ladies and gentlemen, is that inflation is not our friend as we came to sadly learn by 1980 when it hit 12% annual growth and interest rates topped out at 21%. For those of you who were not even born yet, yes, that actually happened the last time the US Congress and President left the barnyard door wide open on spending and neglected all fiscal discipline at the federal level. The problem is not the Fed, or even the White House. All Constitutional power is invested and remains with the elected representatives of the US Congress, most specifically residing in the US House of Representatives. They control the level of spending and taxation in this country, not the President or the Fed. Congress is our duly-elected, constitutionally-sanctioned legislative vehicle that can unwind all of this madness. After all, it is the same legislative vehicle that got us into this mess in the first place. So call or email them daily and tell your elected representatives to turn off the spigot of spending and roll spending levels back to at least 2008 levels...if not 1978 levels.